In 1987 a new idea was formed in Paducah—an idea formed by the Chamber of Commerce to see to it that future businesses and future business professionals had all the leadership tools at their disposal in order to form a more perfect union of people and prosperity. The Leadership Paducah project was initiated and now, three decades later, the program has grown and flourished to its current energized status under the guidance of Chamber President Sandra Wilson and with the support of the Paducah Leadership Foundation and the many Leadership alumni. During the year, the group seeks to enhance its knowledge and understanding of the community from city services and government, to education, healthcare, tourism, and arts and culture. The group meets once monthly from September through June to explore the many facets of the community at large and to become better prepared to lead the future of Paducah/McCracken County forward. Several years ago Leadership Paducah decided to introduce an additional element to the group’s training and educational experiences by creating a fundraising event to benefit a chosen charity. Many worthy organizations have been selected to be the recipient of these driven and dedicated class members. In all of these years, classes have chosen groups devoted to providing services to at-risk segments of the community for individuals, families and/or youth. This year Leadership Paducah Class #31 has decided to provide its unique brand of leadership to a more “civic” project which will undergird the ultimate restoration of the historic Columbia Theatre on Broadway in downtown Paducah. Leadership Paducah Class #31 will hold its Saving the Silver Screen event on June 9 at the Julian Carroll Convention Center and will feature the Big Bang Dueling Pianos. For information about sponsorships and tickets, visit leadershippaducahproject.com. Back from left are Ryan Polczynski, Tim Thurman, Adam Ogle, Barrett Pazderka, Taylor Morsching, Patrick Brumley, Christopher Ewing, Quent Smith, Steven Elder, Joshua Morehead. 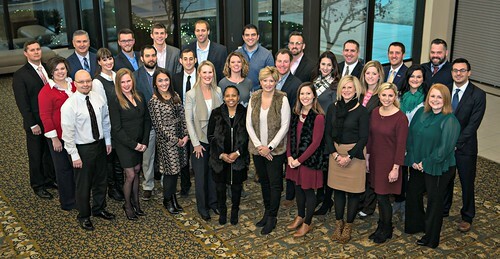 Center from left are Rachel Dunsford, Mollie Bremer, Michael Hansen, Nathan Crawford, Stacy Irvin, Dr. Matthew Mangino, Michelle Campbell, Catherine DuPerrieu, Michele Luksic, David Homra. Front from left are Jesse Morrison, Tonya Goodale, Hillary Chambers, Ashlea McMillan, Chevene Duncan-Herring, Gretchen Morgan, Jessie Meiser, Jennifer Myers, Holly Jones, Arianne Dillon. Not pictured is Amanda Vinson.